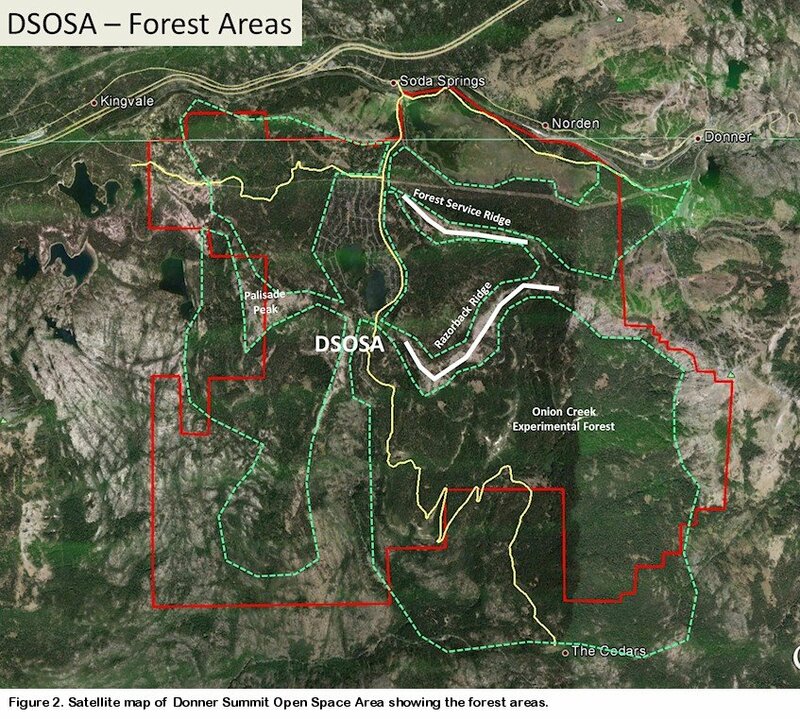 In the previous part of this article about the future of the Donner Summit Open Space Area (DSOSA), the issues of public access to the area were discussed. In this part of the article the issues of wildfire threat and forest restoration will be addressed. Please keep in mind that I am not an expert in forestry or wildfires and this article approaches these subjects from strictly my layman’s point of view and as a long time resident of the area. As most of you know Donner Summit sits at about 7000 feet in the Sierras and receives an average of 30 feet of snow a year. Summer time temperatures during the day rarely exceed 90 degrees and evening temperatures are usually in the 60s and 70s. As a result, in a normal year the summit area remains wet and green through August and there is only a short period of time in late summer, early autumn when the area is dry enough that the vegetation is susceptible to wildfire. The fact that there have been very few wildfires on the summit over the years attests to this low susceptibility. The absence of fire in the area over the years has been a blessing and a curse. While there has been no fire damage to the area, the lack of fire has allowed the build up of fuel over the years as trees live and die. The continuous logging of the area over the last hundred years has helped somewhat to reduce the fuel buildup, but logging has also removed most of the old growth forest in the area. The current forests in the DSOSA area are relatively young and made up of a large number of shorter lived and denser growing Lodgepole pines. In the last 20 years most of the area has been under private ownership and unfortunately there has been very little forestry maintenance in the area. The result is large areas of forest that contain large amounts of tree fall on the ground increasing the potential fuel load for wildfire. Even with the added fuel loads, the threat of wildfire in a normal year is probably still pretty low. The catch here is what about years that are not “normal”. In this age of climate change, there are projections of longer and warmer summers at higher elevations. This will increase growing seasons and further increase the fuel load. It is, however, the possibility of an extended drought that is the most threatening for the occurrence of a wildfire in the region and California is no stranger to droughts. In the event that the summit were to experience a prolonged multi-year drought, the large fuel load would become tinder dry during the summer and in this nightmare scenario the wildfire threat would be greatly increased. Let’s examine the threat of wildfire on the summit in more detail. The threat of wildfire comes from two potential sources. A wildfire could spread into the area from an external location outside of the summit area, or it could start locally from an ignition event such as lightning. Consider the summit area on the satellite map shown in Figure 1. Due to the mountainous topography of the area, there are only a few forest-fuel corridors in which a fire could spread into the area. Probably the most threatening corridor is from the dense forests south of the summit area in the Foresthill and French Meadows area. The prevailing westerly winds in summer could easily push a fire west and north through the forests of the Soda Springs Basin and upslope into the summit area. This area is relatively remote and fighting a fire from this direction would be a challenge. A second corridor enters the area from the west along I80 and would also be driven by the westerly winds. This corridor, however, is well developed and access by firefighting equipment is excellent. Coming from the north, the rocky terrain of the Castle Peak massif would provide little fuel for a fire. This is true too for the mountainous area along the Donner Pass-Mt Judah-Mt Lincoln ridgeline. The only possible corridor coming into the area from the east is up through the Coldstream Canyon-Roller Pass area. A wildfire approaching from the east would require winds from that direction to drive it and these occur less frequently. However, when they do blow easterly winds tend to occur in late summer-early fall when fire danger is highest. They are also warmer and dryer than the prevailing westerly winds. The real problem with the threat of fire from an external location is that there is very little that can be done locally to affect the conditions at the location that the fire may come from. The only local measures that would effectively mediate fire coming into the area would be good forestry practices in the forest areas in the corridors and insuring good access for fire fighting forces in those areas. 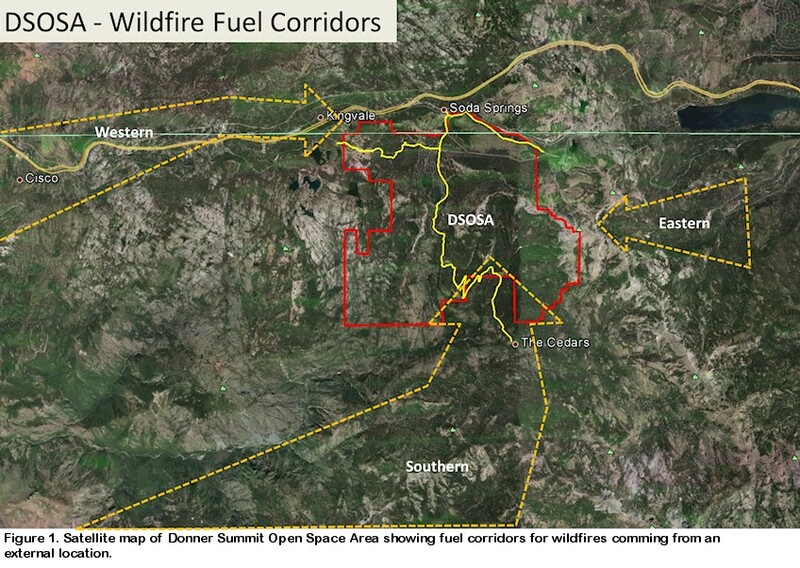 So what is the current status of these forest-fuel corridors into the summit area? Fortunately, in the last few years the Cedars area has been engaged in a serious effort to thin and clean up the forests in their area. This will contribute greatly to lowering the wildfire threat in the southern corridor. Currently there is good, although limited, access to the area via Soda Springs road. Unfortunately, the forest areas on the south slopes of Razorback ridge (see Figure 2) have not been well maintained, including the Onion Creek Experimental Forest. There is abundant ground-fall fuel that could feed a wildfire coming up the southern corridor. Fire from the west is probably much less of a threat because that corridor is populated, the access is excellent and the forests are thinner and better maintained. From the east the natural fire break of the mountains and the Sugar Bowl basin lessen the threat, but driven by strong winds from the east it might be possible for the fire to jump the break. In that case the forests on the south slope of Razorback ridge would again be threatened as well as the forests on both slopes of Forest Service Ridge. 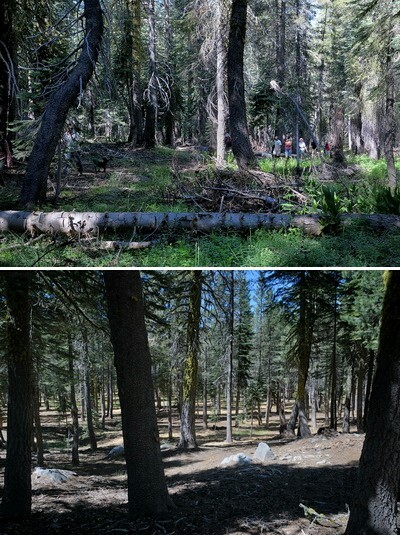 All of these forest areas have been poorly maintained in recent years and have ample ground-fuel to continue the spread of a wildfire through the summit area. While the threat of a wildfire spreading into the area is real under the right conditions, the more immediate danger to the area comes from a local ignition event. The summit area experiences numerous dry lightning strikes during storms in the summer. With the opening of the area as public space the threat of local ignition from careless human activity will also be increased. Whatever the source, the threat of fire from a local ignition event would depend ultimately on the health of the local forest areas. Figure 2 shows the forest areas (outlined in green dotted lines) in the open space area that are divided along the natural breaks formed by mountains and ridge lines. As mentioned, most of the area has been logged at different times in the last century (there are only a few pockets of old growth left), but since the 1980s most of the areas have been neglected. In much of the area the forest floor is littered with tree-fall and the ground-fuel levels are high. In the prolonged drought scenario, a lightning strike in a September storm hitting in one dry fuel rich area could quickly spread, especially with the occurrence of strong winds. In this nightmare scenario there would be little time to mobilize fire fighting forces before the fire spread across the area. With high winds driving it, a wildfire could easily sweep across the entire summit area in a day in it’s current condition. So what do we do? The issues I bring up here are not new by any means and there are many responsible people in the area that have been working hard for years to solve this problem. What is new is the formation of the DSOSA which is effectively consolidating the ownership of a very large portion of the summit area. This presents a real opportunity for the public and TDLT to bring the resources to bear to employ best practices forestry methods to the summit forest areas to return them to good health. TDLT has already contracted a forester to evaluate the situation. SLPOA has dedicated a large portion of its contribution toward this problem. SLPOA has also implemented a program of creating defensible space within the community. The Cedars is employed in a large forest restoration project in its forest. Charlie Jones has done an exemplary restoration of the forests on the west side of Devil’s Peak. While these are all excellent projects, so far they only protect individual parts of the area. Restoration of the large forest areas included in the DSOSA would comprehensively improve the health of the entire summit area and greatly decrease the threat of wildfire. Even in the nightmare drought scenario, it could be the difference between a highly fueled uncontrollable wildfire that would devastate the entire area and much less intense wildfire that could be successfully controlled by fire fighters. The good news is that so far we are not experiencing a drought scenario and we have time to improve conditions. Even better we now have the opportunity to actually get the job done. The goals are clear and it will take support of the entire summit community, so now it is time to get to work. Very informational on a topic we want to deny!